Replace TAPI with VOIP without requiring an internet connection to the TopView computer. 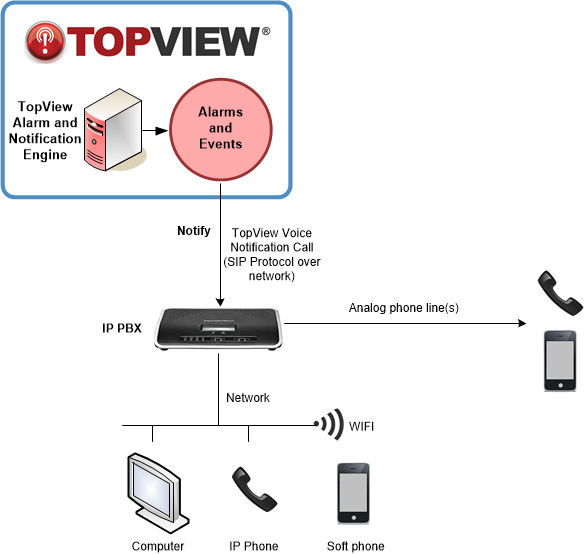 Voice Notification in TopView delivers spoken alarm messages to any phone. The recipient of the phone call can acknowledge the alarm using keys on the phone keypad. If you’ve configured voice call-out alarm notification in the past, you’ve may have had experience with TAPI. TAPI allows software applications like TopView to make phone calls over analog phone lines using a voice modem or TAPI device attached to the computer. Plug the analog phone line into the TAPI device, connect the device to the TopView computer …… In theory this should all work well but the reliability of TAPI devices is highly dependent on the operating system version, vendor provided drivers, audio device settings, and the quality of the device itself. It is common for TAPI implementations to work well “most of the time”, then stop working after a configuration change or software update. In addition it may be difficult to implement communication to the TAPI device from a virtual machine. TopView supports (and recommends) using VOIP for Voice Notification calls. VOIP allows TopView to make network-based phone calls through a VOIP Server. The VOIP Server is typically an existing phone system or a hosted VOIP provider. VOIP is very reliable, does not require hardware drivers, and allows for easy implementation on virtual machines. An overview of VOIP in TopView is available here. How can we move TAPI customers to VOIP if they (1) do not have an existing VOIP phone system and (2) cannot reach an Internet-based hosted VOIP provider from the TopView machine? For a few hundred dollars you can purchase and configure your own IP PBX (VOIP Server) for use by TopView Voice Notification. The IP PBX can bridge the network-based phone calls from TopView to one or more analog phone lines. In addition you can add VOIP desk phones (IP phones) and software based phones (computer, tablet, smart phone) to the network to receive TopView voice calls. Our recommended IP-PBX is the Grandstream UMC6202 which you can purchase from around $250-$400 USD.